Get the Full StoryCheck out the full results of the Floyd Mayweather vs. Conor McGregor FOX preliminary card. The preliminary card for Floyd Mayweather Jr. vs. Conor McGregor is in the books, with two of those four fights airing live on FOX. Welterweights Juan Heraldez and Yordenis Ugas both came away with unanimous decisions, even though they both hit the canvas. Here s how the fights played out, along with quick results of the non-televised bouts. In a battle of unbeatens, the more-experienced Heraldez took a hard-fought victory over the 19-year-old Mexican. Heraldez was crisp on the counter, throwing very effective combinations and often frustrating Borrego, whose forward movement didn t result in too much meaningful offense. Borrego turned up the pressure at the end of round 6, hurting Heraldez with a left hook just before the bell sounded. With Heraldez continuing to essentially win rounds with bursts of offense and quicker hands, Borrego needed a knockout to win, and he nearly got it in round 9, as he floored Juan with a left hook against the ropes. Heraldez beat the count and withstood Borrego s late charge to see out the round, and he went on to take round 10 as well as the unanimous decision on the scorecards. This was an incredibly entertaining contest. It looked like Ugas was going to have Dulorme out of there early, as he hurt him with an uppercut and scored a knockdown in round 2. 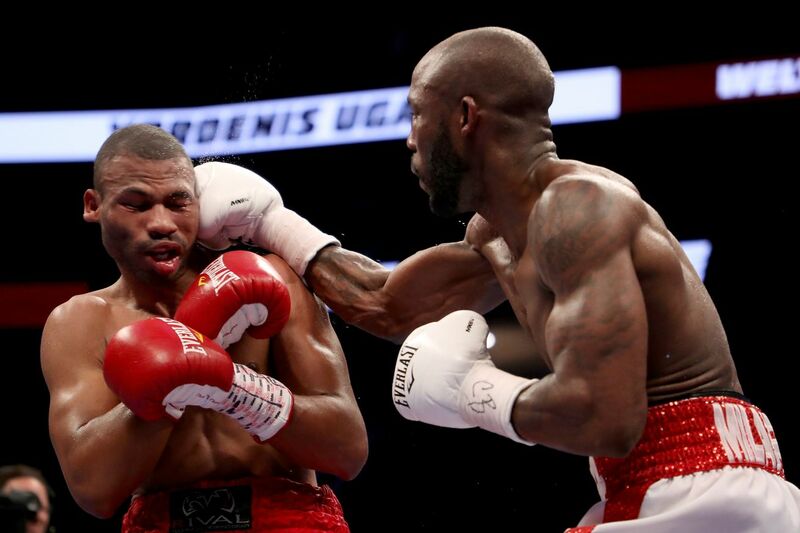 Ugas dropped Dulorme with a right hand seconds later, but Dulorme survived and recovered well after a shaky start. These two traded haymakers throughout the contest, with Ugas perhaps getting the better of the exchanges early, before Dulorme came on strong. Having been docked a point in round 7 for repeated low blows, Dulorme needed to really push for the knockout. Ugas was cracked by a hard shot in the center of the ring, and towards the end of the round he was floored by a left hook. This time it was Ugas in survival mode, and survive he did. The grueling pace of the fight continued into the final few frames, as thunderous hooks, body shots, and uppercuts were landing for both men. Dulorme cost himself dearly with another point deduction for hitting below the belt in the 10th and final round. Cuba s Ugas took this fight on short notice following a late withdrawal from Shawn Porter, and the two knockdowns and two point deductions were crucial in him getting the W tonight in Las Vegas.